If Cars Could Drive, What Cars Would They Drive? So, let’s do a little thought-experiment here. That means everyone grab a big bottle of expired medication and put it in a bag and smash it up and then blend it into a large glass of rubbing alcohol and Yoo-Hoo. Now, chug. All good? Great. Okay, so, here’s the question: if cars could drive, what cars would they drive? I mean, we all know what it means to, say, drive a Corvette as a person, all the stereotypes and feelings, and associations. But if you were that Corvette, and you wanted to go somewhere, but didn’t want to drive on your own — which would be the equivalent of walking, after all — so what would you drive? I’m thinking maybe you’d want to hop into an old Thunderbird. Probably something American. 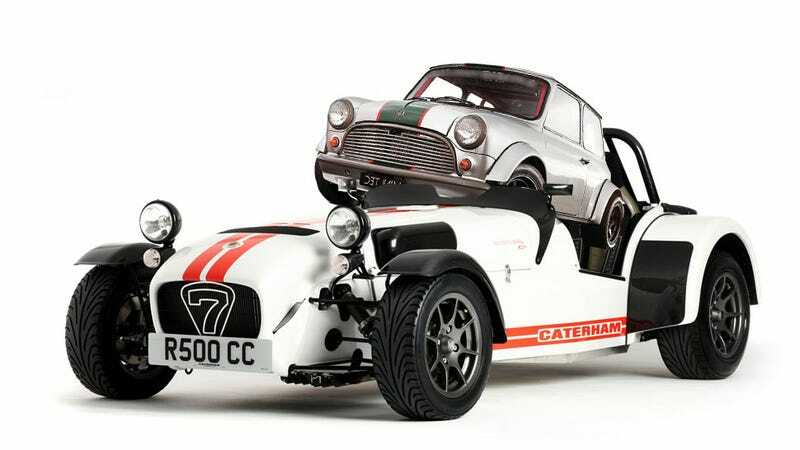 So, I think this’ll work with pairs of cars — a Mini driving a Lotus 7, for example. You’re looking for that inner something in a car that can only be satisfied by driving some other car. See what I mean? Matt actually came up with this idea, so address your accusations of drug abuse to him. I’m totally fine with my intake of hallucinogens. My talking, floating belt sander told me so, before we kissed.